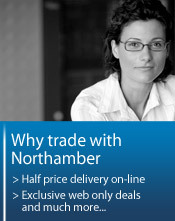 Northamber is the longest established trade-only distributor of IT equipment in the UK. Since 1980, Northamber has been your partner in IT distribution. Today we are widely recognised as the largest UK owned trade-only distributor within our industry. Click here for a list of Northamber Reports & Accounts. Northamber offers flexible trade credit accounts and cash with order accounts with no surcharge on credit cards for orders placed via our website. Next day delivery comes as standard with timed delivery options available. Drop shipping direct to your customers under plain label with no extra delivery costs. A website that's available 24/7 to take your orders, even outside of working hours and at weekends, with help on the web during working hours. We have a fully trained and knowledgable sales team at the end of the phone for your more complicated orders and, for technical configuration help, we have specialists in each area of our business who can answer any pre-sales questions. A fully fitted configuration centre to have your software installed, servers configured and standard images installed onto your systems before shipping. 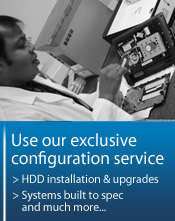 We can also asset tag, pre-configure and custom build PCs and servers. Northamber is a one-stop shop for all your computer needs and we look forward to helping you and your business.